My mother, given half a chance, will be the first person to tell you that I am an unlikely champion for spiders. She was the one who calmly relocated every spider that invaded my childhood bedroom while I cowered screaming and/or crying in a corner. Times change, though, and here I am: studying courtship behaviour and sexual communication in spiders for my master’s degree, handling black widows on a daily basis. I would not be here had it not been for a series of fortunate events leading me to my mentor and collaborator Samantha Vibert. 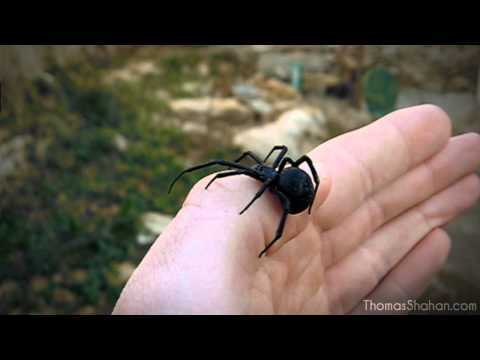 A female western black widow (Latrodecus hesperus) takes a walk on my hand. I took invertebrate biology as an undergraduate at SFU with Mike Hart, and it was by far the best biology course I have ever had the pleasure of attending. Mike made weeks of lectures on worms and other unlikely creatures mind-blowingly awesome. However, when we started to get behind due to a couple of cancelled lectures, he was willing to skip over spiders and their kin, as he is arachnophobic. Luckily Sam, who was doing her PhD on sexual communication in spiders, was my TA, and she brought live spiders into the lab to make up for some of what we’d missed. At the end of the course, she ended up seeking a summer research assistant from among her students. The job was to help with her study of vibratory courtship signaling in western black widows. A little apprehensive, but game for the challenge of overcoming my own fears and participating in some real research, I applied and got the position. I immediately fell in love with black widows and have been fascinated by spiders and their incredible behaviour ever since. 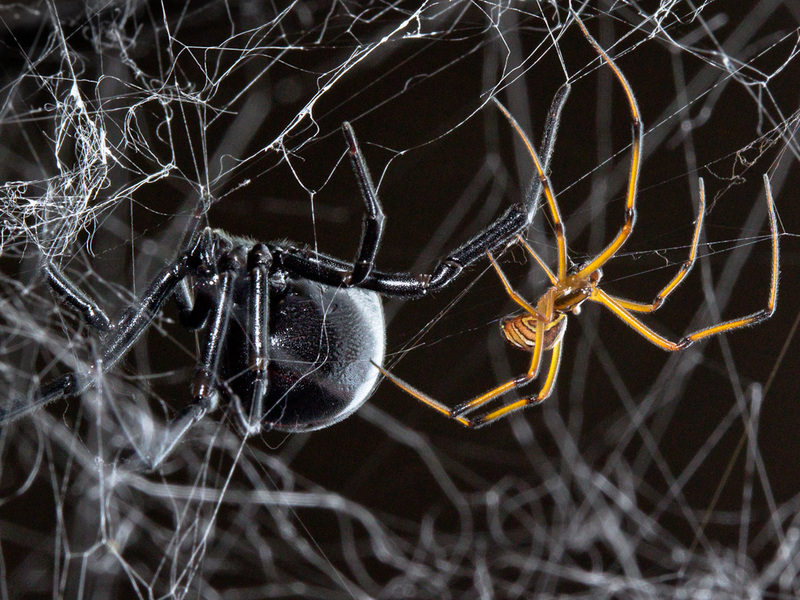 A male western black widow courts a female on her web. Currently, I am wrapping up my master’s research and writing my thesis. Starting this blog seems like a great way to procrastinate exercise my writing muscle as I struggle with the formal writing of my thesis. As I’ve been sifting through the literature for my introductory chapter, I’ve come across so many amazing papers – from basic descriptions of natural history to investigations of the incredibly sophisticated and diverse communication systems of spiders – that I’m having a hard time keeping track of all the cool stuff I’ve learned. One function of this blog will be to concisely summarize some of these stories and organize them so that I can easily remember and come back to them. If anyone else ends up reading and learning something about the incredible biology of spiders, and maybe starts to fear them less and like them a little bit more, it will be a fantastic bonus. Note: all photos used with permission from Sean McCann. Well done, Catherine. I conclude that your mom is awesome! Fantastic new blog!! Great beginnings….am looking forward to reading your posts. Great to see a new spider blog, I’ll be following. And thanks to Chris and Sam for getting you here. Looking forward to learning many new spiderbytes! I have nominated your blog for the Wonderful Team Member Readership Award. This is a wonderful spider blog — wry, informative, and highly readable. I’m sure your thesis will be just as good and you’ll go on to great things. Best of luck! Thank you so much, I really appreciate the feedback! I just found your site (spiderhugger) and I love it! Awesome work! I saw this image (and an accompanying video). Something seems off. Is this a Black Widow and do they really get this big? If this is a BW, maybe it is not a Western but a Red Back? 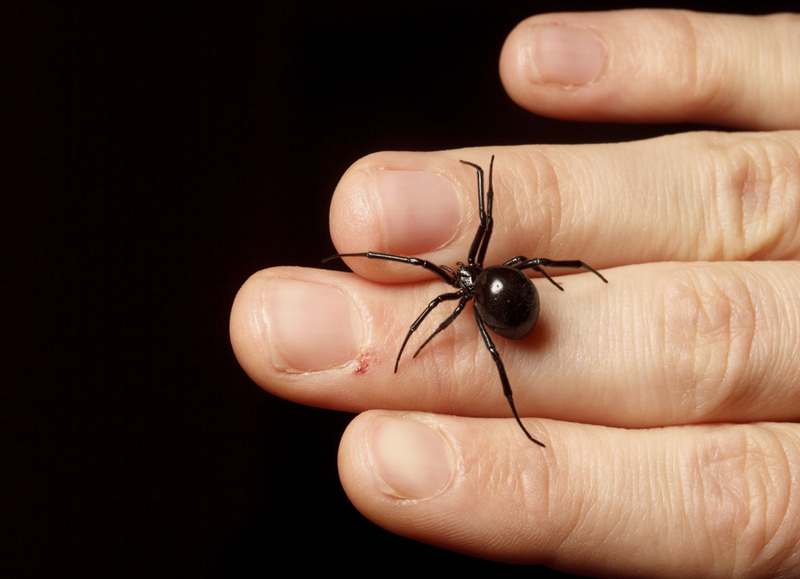 This is Latrodectus mactans (the southern black widow). But even western widows can get to be this large. Great video by Thomas Shahan! I used to be afraid of all arachnids. I realized this is a silly “learned fear” and overcame it. I also preach this often to people. Especially in Chicagoland, where there is not really an abundance of arachnid-based dangers. And even then, these aforementioned dangers are blown out of proportion. However, there was a catalyst in overcoming my fear and this occurred on island of Guam. I had a close encounter with the largest spider I had ever seen. As big as my head though more petite than a Goliath Bird Eater, it was comparable in circumference. I figured, sheesh, there isn’t much left to endure, what’s the point? Because I don’t fear them and I believe they do serve an important purpose, I let them be in my house. I have an additional question if you don’t mind? I am in Illinois, Chicagoland. Yellow Sacs. I usually let them be, however, I have read some (not so legit) pieces that I should beware. What do you think? A friend of mine spent a few weeks in the jungles of Guyana and took a pic of a spider that the locals had never seen before. I would like to share the pic but I do not know how to post a pic. Any ideas? I live in Munith Mi. And not sure if this is a Brown Recluse Spider can I send a picture to u ?